A new image of a gaseous space nebula reveals tens of thousands of giant comet-like knots raining down in a star-spangled cosmic fireworks display. The gorgeous photograph by Japan's Subaru Telescope in Hawaii, released this week, reveals fresh details about the aftermath of a star's death, but the origin of the knots remains a mystery. Each knot is about five times the size of the orbit of Pluto in our solar system. The relatively nearby scene -- just 710 light-years away -- is a close-up of small section in the Helix Nebula, also named NGC 7293. It's within our Milky Way Galaxy. The Helix Nebula is known as a planetary nebula, named not because it has anything to do with a planet but because when the class of objects was first discovered, in early crude telescopes, their fuzzy appearance resembled planets in our solar system more than point-like stars. Astronomers have since learned that planetary nebulas are the final stages in the lives of low-mass stars like our sun. The nebulas come in a stunning array of shapes and colors. Unlike real fireworks, the scene in the Helix Nebula involves no explosion. 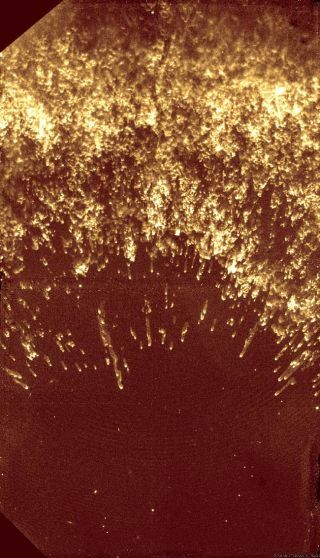 Rather, as a sun-like star ages, it ejects material in stages over tens of millions of years. A wind of charged particles continues to flow from the aged star, and the wind runs into the previously ejected layers, creating shock waves. Radiation from the star ionizes atoms in these outward-racing crash sites. Tiny particles are forced together and emit light. The knots might be remnants of planets that once existed around the star, astronomers figure. Or perhaps they involve material ejected from the star at some stage in its life. Nobody knows. The new observations allowed astronomers to estimate there are up to 40,000 knots in the nebula, with a total mass of some 30,000 Earths, or about 10 percent the mass of our sun. Each knot contains hydrogen molecules. Although these molecules are often destroyed by ultraviolet radiation in space, they have survived because they are shielded by dust and gas, the astronomers explained. The comet-like shape of these knots results from the steady evaporation of gas from the knots, produced by the strong winds and ultraviolet radiation from the dying star in the center of the nebula. "This research shows how the central star slowly destroys the knots and highlights the places where molecular and atomic material can be found in space," said lead astronomer Mikako Matsuura of the University College London. The research will be detailed in August in the Astrophysical Journal.